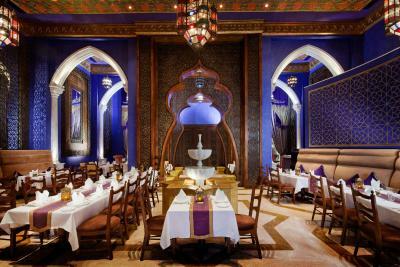 Lock in a great price for Jumeirah Zabeel Saray – rated 8.7 by recent guests! We came for our anniversary and they made our stay very memorable. 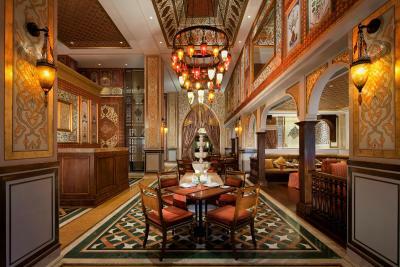 The decor of the hotel is fabulous; if you like Turkish design and architecture you will definitely like this hotel. The staff were great, very hospitable. The food in each of the restaurants were exceptional as well as their staff. 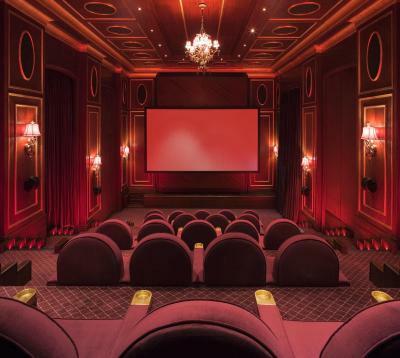 The hotel was grand and beautiful would definitely come again! It was amazing to stay in such a nice hotel, the location was perfect. 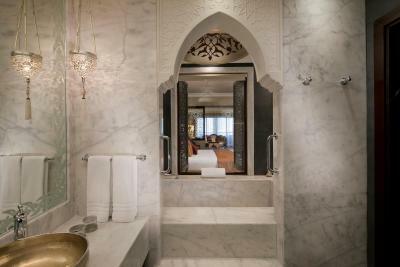 Jumeirah Zabeel Saray This rating is a reflection of how the property compares to the industry standard when it comes to price, facilities and services available. It's based on a self-evaluation by the property. Use this rating to help choose your stay! 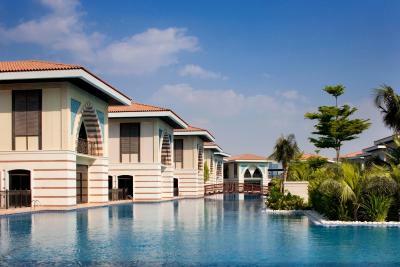 One of our top picks in Dubai.This property is 3 minutes walk from the beach. 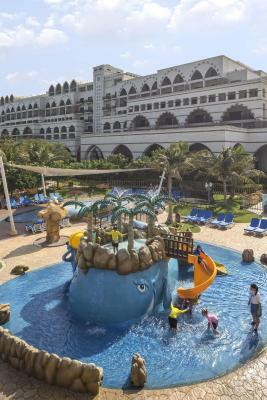 Located on the West Crescent of the famous Palm Jumeirah and overlooking the Arabian Gulf, this resort offers luxurious rooms with private balconies, access to Talise Ottoman Spa and free unlimited access to Wild Wadi Waterpark. Facilities include an outdoor pool, 10 restaurants and bars. 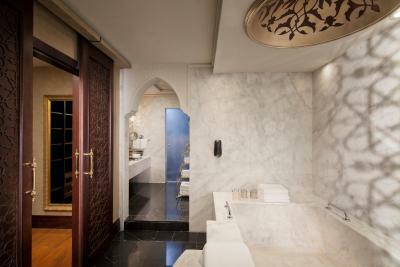 Guests can enjoy exclusive treatments at the Talise Ottoman Spa, which features the Middle East’s largest Turkish bath. Guests can choose from sports facilities such as the fitness center, tennis and biking. 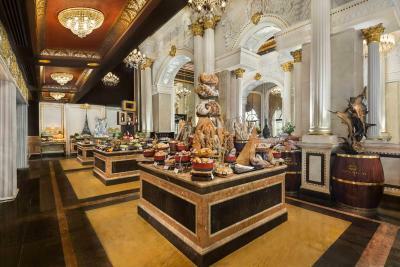 The Jumeirah Zabeel Saray resort harbors 10 restaurants offering worldwide specialties such as Turkish cuisine at Lalezar or Italian-inspired delicacies at Plaj overlooking the Arabian Gulf. Voda Bar offers an extensive selection of cocktails in chic surroundings. 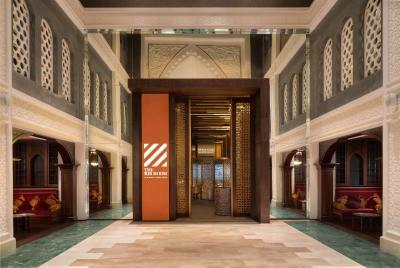 The property provides complimentary shuttle service to Wild Wadi, Jumeirah Mina A'Salam and Mall of the Emirates. 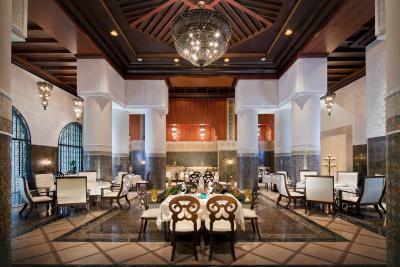 When would you like to stay at Jumeirah Zabeel Saray? 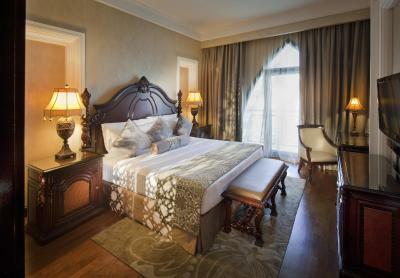 Spacious room boasting an Ottoman theme. Spacious suite featuring high ceiling and dark wood décor. Features 2 flat-screen TVs. 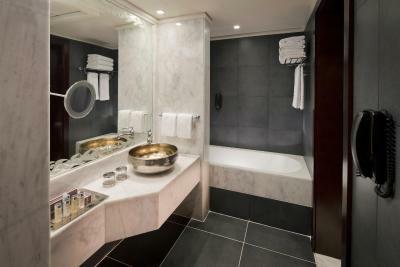 Please note that some suites connect to a Deluxe King Room. 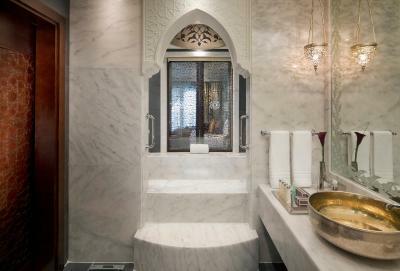 Decorated with an opulent Ottoman-inspired style, this room features two bedrooms: a master king bedroom with a private bathroom and a second twin bedroom, also with a private bathroom. It includes a private balcony with views of the Arabian Sea, exclusive amenities by Asprey London and a complimentary basket of fruit upon arrival. 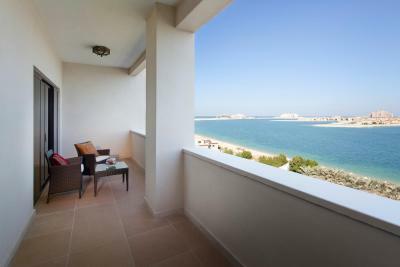 Features views of Palm Jumeirah, surrounding greenery and the Arabian Gulf. 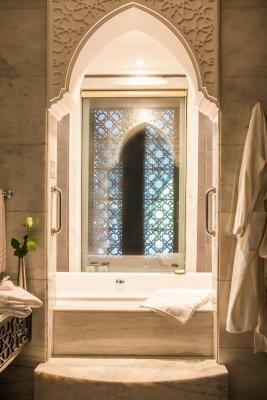 Featuring a private balcony overlooking the city's shoreline, this air-conditioned room is decorated in Ottoman style. It includes free Wi-Fi, a flat-screen TV and an iPod docking station. 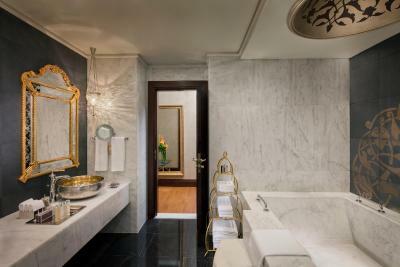 The bathroom is fitted with a rain shower and a large Turkish marble bathtub. This room includes one complimentary entrance to Wild Wadi. 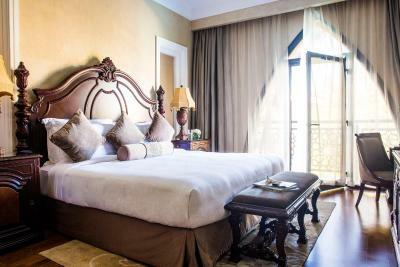 Featuring a private balcony overlooking the city's shoreline, this air-conditioned room is decorated in an Ottoman style. It includes free Wi-Fi, a flat-screen TV and an iPod docking station. 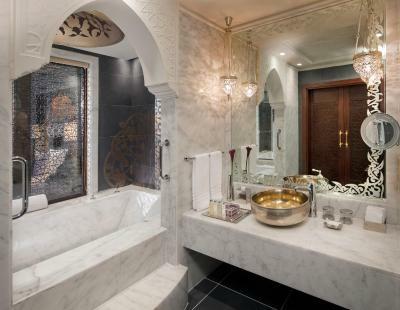 The bathroom is fitted with a rain shower, a large Turkish marble bathtub. The Club Double Palm View room features breath-taking views over Palm Dubai.The generous 56 square yard Deluxe Double Palm View room features opulent Ottoman-style decor, a private balcony, two double-sized beds, a magnificent marble bathroom, exquisite Penhaligon's amenities and a welcome basket of seasonal fruits. In addition it gives you a complimentary internet access, complimentary access to the Club Lounge offering all day tea, coffee and soft drinks and complimentary airport transfer to and from Dubai International Airport, once during the stay. This quadruple room has a soundproofing, satellite TV and tile/marble floor. 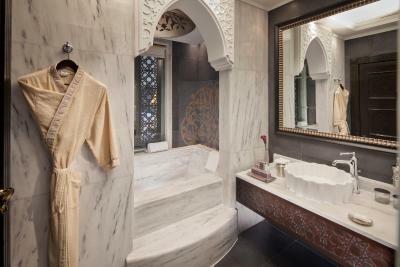 House Rules Jumeirah Zabeel Saray takes special requests – add in the next step! 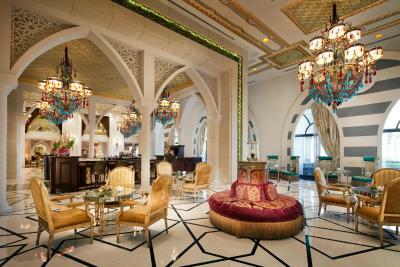 Jumeirah Zabeel Saray accepts these cards and reserves the right to temporarily hold an amount prior to arrival. All guests can enjoy complimentary access to Wild Wadi Water Park and private beach. 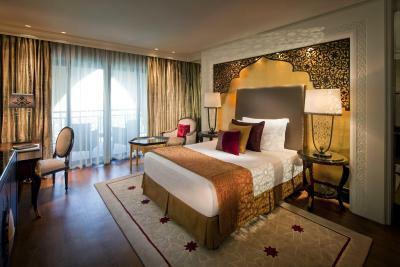 Zabeel Saray Rewards package includes Resort credit from 200 to 2000 AED based on booked room category, per stay of 4 nights, which can be used on selected dining and spa options. In order to continually enhance the guest experience, the infinity pool will be closed for maintenance from 5 to 20 May 2019. As an alternative guests may use Lagoon Pool at the magnificent Royal Residences. No check outs allowed on and Gala Dinner is mandatory on 31st December. Check in is very fast and smooth. Lack of information about the services available. The facilities were extensive, the restaurants were of a very high standard and the staff were incredibly attentive and genuine. Perhaps golf golf buggy rental to enjoy the boardwalk of the palm? The staff were fantastic with our requests relating to our autistic son. Really could not have been more helpful. Would definitely return. The fact that one of the restaurants was closed for a corporate function on our last night. We had planned to visit on Thursday evening and it was most disappointing that you hadn’t informed residents of this. The attitude of the staff was awful. The staff was not friendly at all. This is not the same hotel as it was before few years. More beds at the beach and pool. And the view from the bedroom straight at a wall very disappointed with that. Breakfast was not “continental” and the price too high for the selection. Prices at the pool restaurant also very high. The beach was nice but the sea is full of jellyfish and not usable. Located at the crescent of the palm the distances are more far than expected. The hotel is great, the rooms very spacious and the staff more than friendly!! The beach is really nice and the pool was heated which was great with little children!! Some jellyfish in the sea, but it's not the hotel's fault. 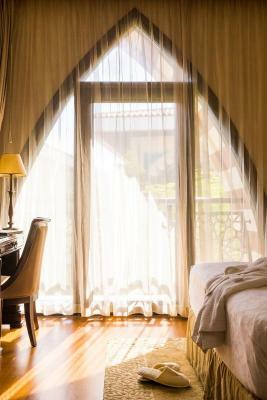 Beautiful hotel, great room with very comfortable bed. The staff makes you feel really welcome. Spotless clean.